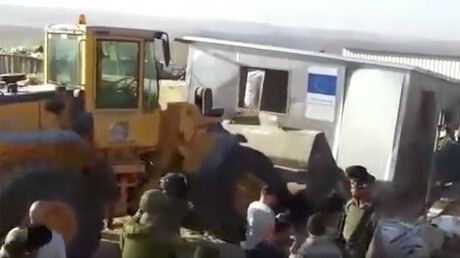 The Israeli authorities have ordered a Palestinian school east of Jerusalem to be demolished as they say it was built without permission, despite coming under pressure from the EU and the UN for Israel to stop destroying Palestinian buildings. The primary school is located in Kahn Al-Ahmar, which is a Bedouin village and was built in 2009 with money given by the Italian government. 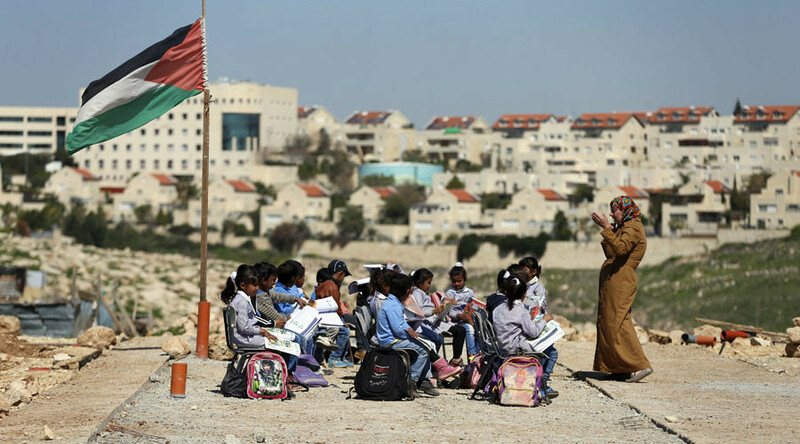 The Israeli authorities want the school, which provides an education to around 170 children, demolished because it was constructed near a planned road expansion. “We continue to call on the Israeli authorities to fulfill their obligations as an occupying power and to rescind all policies and practices that – directly or indirectly – lead to the forcible transfer of Palestinian Bedouin families,” said David Carden, who heads the UN’s West Bank Office for the Coordination of Humanitarian Affairs, according the Jerusalem Post. The Bedouin community is horrified at the prospect of the school closing with Khalid Quzmar, a lawyer with Defense for Children International, saying that the school was essential to the local community. “Israeli authorities always claim that buildings are closed down or demolished because they were built without permits. But how are Palestinians going to get permits when Israeli authorities often times refuse to grant them?” he said, as cited by UPI. Meanwhile, local residents took part in a protest on Wednesday, which was organized by the Palestinian Ministry of Education. These people are “among the scores of vulnerable Palestinian communities across the occupied Palestinian territory who struggle daily to meet their basic needs and realize their rights in a coercive environment that creates pressure on them to leave their homes,” Carden said, the Jerusalem Post reports. Shlomo Lecker, a lawyer who is representing the Bedouin community said that the Italian ambassador is aware of the situation. Meanwhile, he added that the Palestinian authorities have decided to take matters into their own hands. Both the EU and the US have spoken out about the continued destruction of Palestinian settlements by the Israeli authorities. The EU says that 107 Palestinian buildings have been demolished in 2016, which has led to 136 people being displaced. “We remain concerned about the increased demolition of Palestinian structures in the West Bank and East Jerusalem, which reportedly have left dozens of Palestinians homeless, including children,” US State Department spokeswoman Elizabeth Trudeau said on August 10. “The Israeli authorities must halt demolitions of Palestinian houses and property, in accordance with its obligations as an occupying power under international humanitarian law, and to cease the policy of settlement construction and expansion, of designating land for exclusive Israeli use and of denying Palestinian development,” the bloc said. The school is located in Area C, which makes up around 60 percent of the West Bank and is fully controlled by Israel. The 1995 Oslo agreement divides the whole territory of the West Bank into 3 areas - 'A', 'B' and 'C', controlled by Israel, the Palestinians or the Palestinian Authority with Israeli military control. Such a division was only intended to be temporary with authority set to be transferred to Palestinians at a later date. However, for more than 20 years the agreement has never been revised. “There were so many calls to annex Area C. The latest came from the Agricultural Minister of Israel, knowing that the Israeli government is right-wing today, especially with the latest addition of Avigdor Lieberman as the Minister of Defense,” Dr. Saad Nimer from Birzeit University told RT. “In his own program, Lieberman says that we have to expel the Palestinians, to transfer the Palestinians. I don’t think it would be weird for them to do it. They’ve been talking about this for quite a long time, and they are willing for expel these Palestinians – four percent of the population - out of Area C and annex it to Israel,” he added.